Mammut Nordwand HS Flex Hooded Jacket. When the mountain is calling you: the Nordwand HS Flex Hooded Jacket Men banks on a carefully considered combination of materials with 3-layer GORE-TEX material and innovative, highly bi-elastic GORE-TEX Stretch material, which makes the hard shell jacket wind- and waterproof and affords you maximum freedom of movement, so that you can get around the mountain quickly and easily. 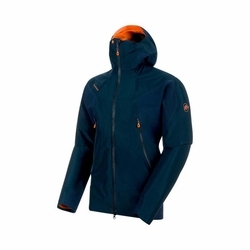 The jacket favors alpine movement sequences thanks to Mammut Vertical Motion Technology for optimized ergonomics. In addition, the jacket draws on Mammut High Reach Technology for unrestricted freedom of movement when climbing, to overcome any obstacle in the mountains. For all those who love a challenge.